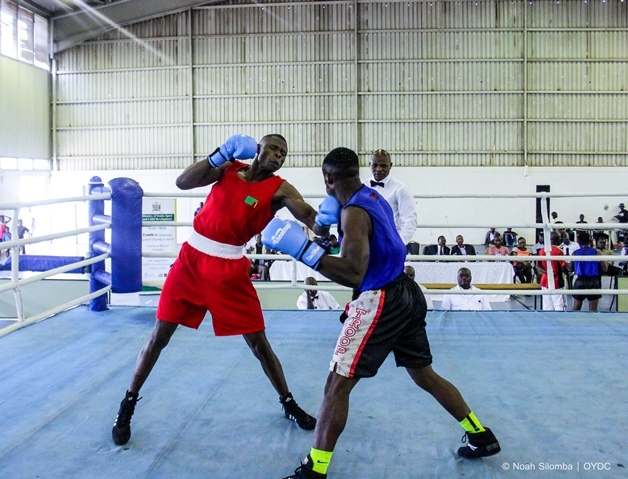 Zambian boxer Benny Muziyo on Saturday 17th March, 2018 flogged Malawian boxer Elias Kassim through a technical knockout in 10 seconds during the international friendly boxing tournament organised by the Zambia Boxing Federation (ZBF) and staged at the Olympic Youth Development Centre (OYDC). The Malawian boxer could not stand the fistful jabs from Muziyo before getting “knocked out” in a blink of an eye leaving hundreds of spectators jubilating. Speaking shortly after being declared winner Muziyo, said the training he has being undergoing at the OYDC ahead of the Commonwealth Gold Coast Games in Australia has yielded good results and sends a strong signal to boxers he will face in Australia. He added that Saturday tournament against Malawi was just being used to show how he (Muziyo) and other Zambian boxers are well prepared for the Commonwealth Games. And Malawian boxer Kassim, described the fight as tough and accepted defeat. Meanwhile, Zambia Boxing Federation (ZBF) president Kennedy Mubita, has expressed happiness with the technical team for ensuring that the boxers had put up a great performance by winning all the 10 bouts. He has applauded the technical team for the tireless job they are doing by training the boxers. Other Zambian boxers who won the fights include Nkumbu Silungwe beating Harvey Mkacha in a 3-0 bout, Everisto Mulenga beating Daniel Lombola in a 2-1 bout and Margaret Tembo beating Mphatso Metaudzu in a 3-0 bout. Emmanuel Ngoma, and Mbachi Kaonga are among the five boxers who will represent Zambia at the commonwealth games. The 2018 Commonwealth Games, officially known as the XXI Commonwealth Games and commonly known as Gold Coast 2018, is an international multi-sport event for members of the Commonwealth that will be held on the Gold Coast, Queensland, Australia between 4 and 15 April 2018.